The Episode starts with voiceover telling about Ram, Sita and Laxman leaving from Rishi Atri’s ashram. They went ahead facing many hurdles, and then came across the Rishi’s dead bodies. Ram and Laxman killed the Rakshaks, and gave new life to numerous Rishis. 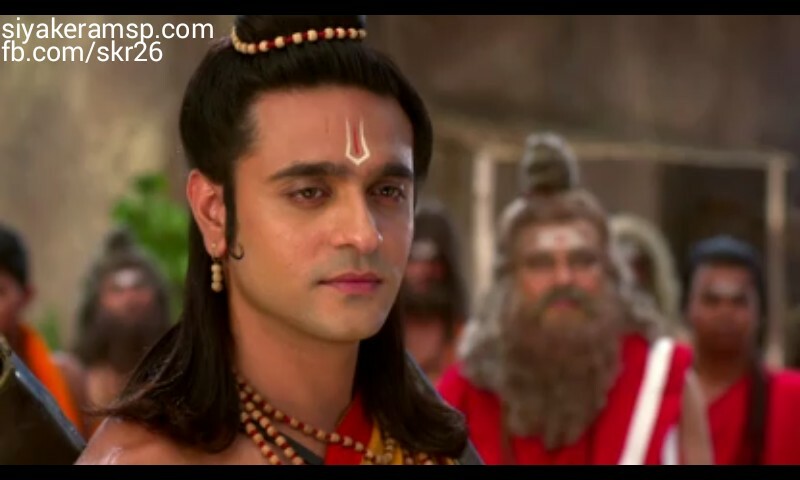 After 10 years, Ram succeeded in his motives, he reached Panchvati but the battle was still left. Maharishi Agasthi welcomes Ram, Sita and Laxman. Ram says we are blessed to meet you. Maharishi Agasthi says your bravery and good deeds made the Raghuvansh shine. Ram says its our Dharm to save people, the jungle is free from Rakshaks, but Rakshaks can attack again, if you permit, we want to make a secure centre in jungle so that we get aware of any danger. Maharishi says your thought is good, I want you to give knowledge and security lessons to the Rishis here, so that they can protect themselves and others. Ram says sure, Laxman and I will be glad. Maharishi asks them to rest some time, there is lake and all type of fruits are present too, this place is right for their stay. Ram likes the suggestion and asks Sita and Laxman their opinion. Sita says the jungle which has power to attract Rishis, it will be good, I agree. Ram asks Laxman. Laxman says where you and Sita are there, that place is pure for me. Ram says we will stay in this ashram hut for some time. Rishis cheer for Ram. Maryada Purshottam Ram…plays……..
Hanuman is sleeping. He wakes up by the sunlight. Surya Dev appears there. Hanuman greets him. Surya Dev blesses him. Hanuman says you here.. Surya Dev says you gave me promise as Guru Dakshina, that you will always protect my son Sugreev. Hanuman says yes, I promised, but I.. Surya Dev smiles and says you forgot. Hanuman says they fight with me for small things, I love peace and come here. Surya Dev says I know, but I sense big danger coming on Sugreev, so I came to you, go to Sugreev and protect him. Hanuman apologizes and says don’t worry, I will leave right away. Surya Dev blesses him and disappears. The monkeys have a fight. Sugreev asks Bali to hear him first, and assures he did not do anything. Bali beats him and says I gave you responsibility to protect this garden, all fruits are stolen. Sugreev says I don’t know. Bali asks did you eat all mangoes. Sugreev says no, I did not do so. Bali says I think I have to beat you more to make you admit truth. Hanuman comes and stops Bali. Bali asks him to move away. Hanuman says I will punish Sugreev. Sugreev thinks Hanuman went as my friend and came back as my enemy. Bali says ask Sugreev, where mangoes disappear. Hanuman says you are punishing Sugreev just for mangoes. Bali says yes, its very delicious mangoes. Hanuman praises Bali and says Sugreev does not dare to tell you truth. Bali asks Hanuman to ask him, and goes. Hanuman calls Sugreev a friend. Sugreev gets annoyed and says you came to punish me, and does not help me, I won’t talk to you. Hanuman says but friend….. and smiles. Ram gets Sita somewhere, covering her eyes. She asks where are we going. Ram says wait for some time. She says it seems like good essence and pureness around, where did you get me. Ram asks her to see. Sita smiles seeing the visual delight scenary and says if there is heaven anywhere, it will be here. Ram says it will be Ram’s heaven, Laxman and I will make a hut, you make it a home. She says its my good luck, but where will we make a hut. Laxman comes there and says I found that place, if Ram permits, I would like to show that place to Sita. Ram says sure. Laxman asks Sita to come. Sita goes. Hanuman smiles and talks to Sugreev/someone. Sugreev tells about his love, and FB shows the lover girl Roma. Roma and her friends come to jungle to meet Sugreev. Her friends say there is no mango here. Roma says how is this possible, look at that side. Sugreev gets all mangoes and presents for her. She turns and he hides. She sees the mangoes and smiles. Her friends ask who kept the mangoes here, did that monkey man keep it here, we should not accept it. Roma sees the monkey tail and says if anyone kept it, it would be by love, we should accept this. Her friend says anyone may come, we shall leave. Mandvi looks on sad. Bharat says Mandvi. She says my identity and existence is very small infront of your great sacrifice, I can’t be equal to you. He says this is not my sacrifice, but my motive of life. She asks will you stay live like this forever. He says I thought something, I realized the knowledge and teachings I got in Vashisht ashram and Kaikeya, this is right time to use it, else it will be misuse and insult of knowledge. She says you are saying right, I also want to use my teachings, it will be useful for Ayodhya’s development, I m worried for Ayodhya’s girl’s education, its imp for women to be literate, as an educated woman can educate many others, she can make two generations rid of illiteracy, this is my motive now. Bharat says I learnt imp thing, I realized what I m doing is useful, I could not give you as a husband, but you gave me everything as a wife. He praises her and they smile. Sugreev says she used to come and I used to give her mangoes by hiding. Hanuman asks who is she. Sugreev says she is Gandharao Raj’s daughter Roma. Hanuman says you loved her, Gandharao Raj will not agree. Sugreev says I won’t talk to you. Hanuman says wait, I will ask her first does she love you or not. Sugreev says I will come along. Hanuman says no, I don’t know her reaction. Sugreev says I will come along, I want to see her, I will not enter Raj bhavan. Hanuman asks him to promise. Sugreev promises him. Hanuman says but how will I know her. Sugreev says she puts such flowers in her hair, you can know her now. Hanuman takes flower and smiles. Hanuman sees the girls and wonders who is princess Roma. The girls get scared seeing him.